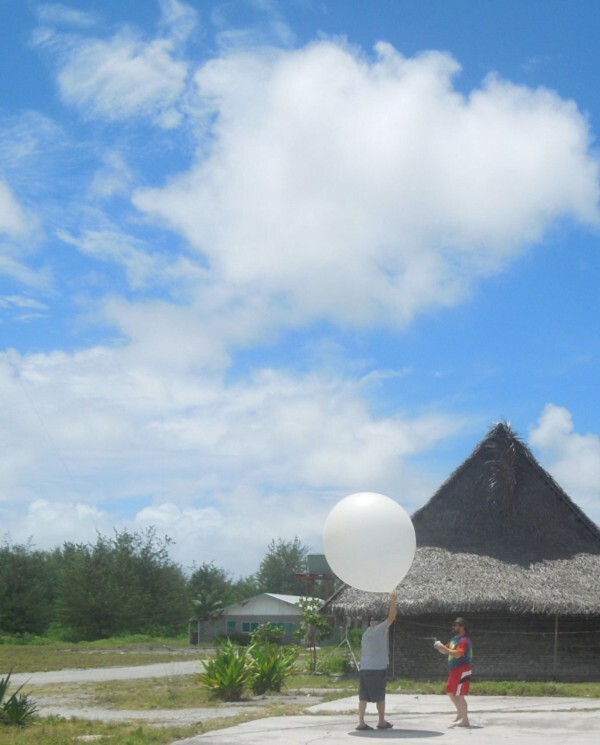 KIRITIMATI ISLAND, Kiribati — 0040 Island Time / 1040 Zulu: Wake up and shake off the cobwebs and head outside to begin preparations for balloon filling. 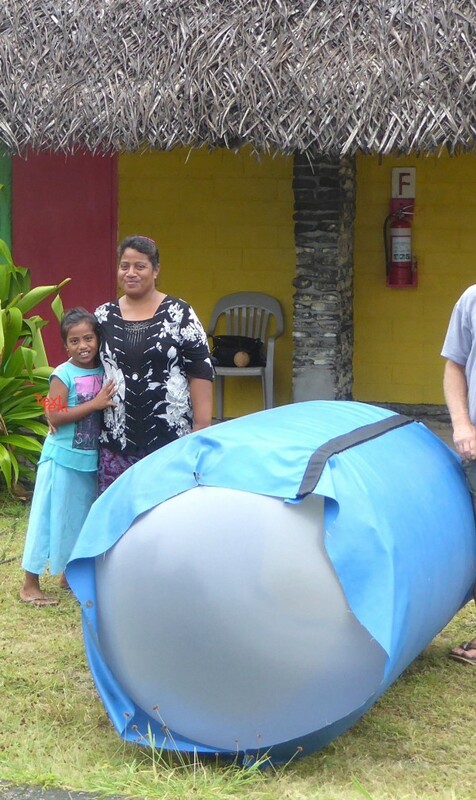 0045 Island Time / 1045 Zulu: Begin by placing the “balloon filling bag” (a nifty in-house, custom-made, vinyl sheet roughly 10’x7’, folded onto itself with velcro to make a tube 7’ long with a 10 ’circumference) on the ground and spreading it out evenly. After much experimentation, I determined that to have the filled balloon be centered in the tube, we need to start with the empty balloon heavily offset to the non-filling side of the balloon. After some trial and error, a gap of 12’’ between the tip of the balloon and the non-filling side edge of the canvas has proven ideal for me. It appears this tube has been calibrated to hold a 350g balloon at the correct volume to achieve 5m/s ascent rate. Ideal ascent rate is considered to be anywhere from 4.0–6.0m/s. Thus, the canvas tube serves as a guideline for filling the balloon to the proper volume of helium. 0100 Island Time / 1100 Zulu: Balloon should be nearly full and almost ready for flight. I’ve discovered that if I fill the balloon to the proper volume and let it sit for five minutes, it expands beyond the confines of the bag. So I’ve learned to stop and wait for thermal expansion to catch up. I overfilled one balloon and learned that we’re not allowed to let some helium out. Once a balloon is overfilled, we have to dispose of it and fill a new one. Leslie and I wrote some messages on the overfilled balloon and released it without a sonde attached. As I’ve been prepping the balloon, Leslie is preparing the sonde to attach to the balloon — this involves reconditioning and calibrating the sonde with our ground met (weather) station and allowing enough time (5–10 minutes) with the sonde right next to our ground station to achieve and confirm a good calibration. Alex, at right, during a balloon launch. 0114 Island Time / 1114 Zulu: We attach the sonde’s “winder” (a spool of string about 100’ that connects to the sonde) to the balloon and take the balloon (still in the tube), the sonde, and the winder to our “launch pad.” At the launch pad, one person quickly pulls the velcro off the canvas tube, which nicely releases the balloon, while the other person holds onto the balloon with one hand and the sonde with the other. Sometimes as we let go of the balloon, the string on the winder gets stuck so we hold onto the sonde (with a death grip) and let the balloon go first. That way, if the winder gets stuck, as the balloon goes up, we still have a hold of the sonde and can pull the balloon back down to de-snag the string from the winder and then let it go again. If the winder appears to be letting the string out as it should, we let go of the sonde and the flight is in progress! 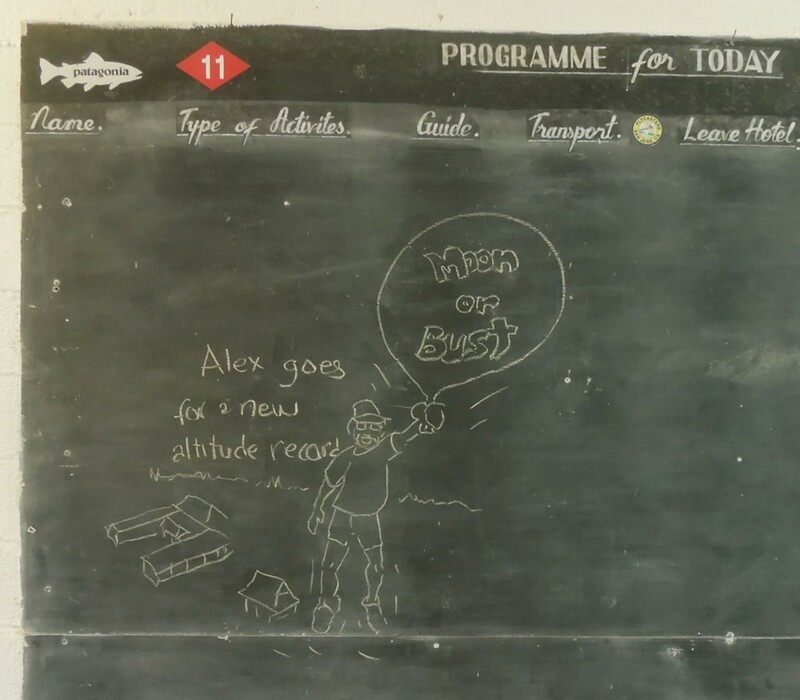 While I’ve been on Kiritimati Island, conditions have been fairly mild and most launches have been simple textbook launches. We’ve had a couple launches in 10 m/s winds, which makes everything much more difficult as the balloon gets very squirrelly. I have a lot of respect for the folks doing this from the RHB research ship, as their conditions are much more severe — including launching from a rocking and rolling platform covered with many obstacles. Here on the island, a group of ham radio operators visited for two weeks, and they created a few obstacles for us with their antennas and guy wires. 0115 Island Time / 1115 Zulu: Ideal balloon launch time. Shortly after launch, we take a couple minutes to make some visual observations of the sky and clouds around us and hopefully take pictures. I’m usually pretty excited at this point and eager to get back to the telemetry and see what’s happening. 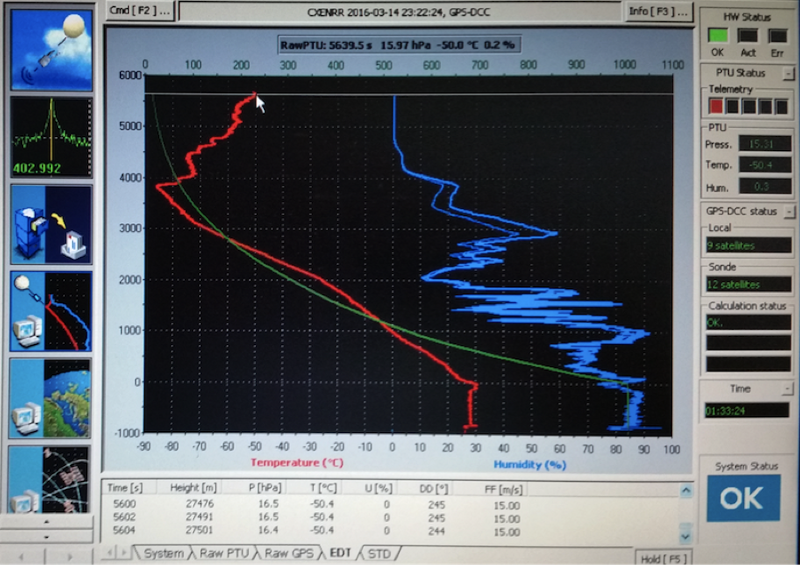 Here’s a screen shot from one of our higher flights, showing the pressure, temperature and humidity plotted as the balloon ascended through our atmosphere. 0200 Island Time, 1200 Zulu: The balloon should be at height for our coordinated synoptic snapshot of the atmosphere — typically at about 170hPa (13.5KM) by this time. Some our longest flights were over 100 minutes, which takes us to 0340 Island time. After the balloon bursts, we then record the downward data as the sonde falls to the ground. Upon completion of flight up and down, we process the data and get it ready for upload to Boulder. Internet access on Kiritimati Island at the Captain Cook Hotel is only available from a small footprint of the lobby, which is about 5 minutes away from our launch site. 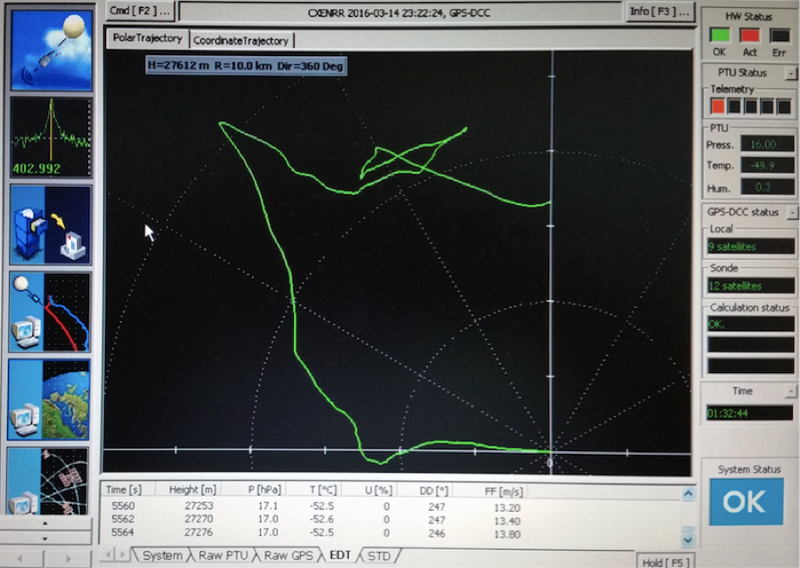 Here’s a polar view of a balloon’s trajectory as it has flown — this is the corresponding trajectory of the “PTU” plot above. I love seeing these plots and putting together theories on why the balloon did what it did. 0345 Island Time / 1345 Zulu: Ideally we’ve uploaded the data to Boulder so that it can be used for multiple model runs. 0400 Island Time / 1400 Zulu: After we’ve uploaded the data, we have some time to read and write email. 0430 Island Time / 1430 Zulu: Time for bed (again). We repeat the entire process again at 1400 Island time (0000 Zulu). A quick note about this schedule: I have traditionally not been a “napper” and have always been rather “light activated,” so for me, sleep has been the most difficult part of this project. Getting between 1–4 hours of sleep at a time was not working, so I decided to forgo breakfasts and fight my “light activated” nature to hopefully get 5–6 hours of continuous sleep once a day and then supplement that with a nap after dinner. Not being a meteorologist, this has all been new to me and very fascinating. Fortunately, I’ve had an expert meteorologist by my side who has been more than willing to answer all my questions. The first thing I learned about meteorologists is that they love to measure heights in pressure. That has taken some getting used to! Our up sondes have instruments that measure temperature, humidity and pressure as well as a GPS receiver that gives accurate information on position (used to calculate wind speed as well as other things). As the sonde goes up through our atmosphere, it collects this information and transmits it to our ground station (via a 403 Mhz signal) where it is time stamped, stored, and plotted on our display, even before it gets packaged and uploaded to Boulder. It’s been fascinating discussing what all this means and the implications of it all. This has been an awesome experience for me. I hope you enjoyed reading about my adventure!